As what I usually do during my rest day nights I watched a movie thought DVD. On this day I watch one of the most popular film that was Ever shown. I is entitled the notebook. I heard a lot of comments about this film from my friends but I never had the chance or should I say interest in watching it. Until tonight. At first I thought that I would get bored because I thought that I was an old movie with an old setting. I just kept on watching it not realizing that I actually loving the movie. I did not even notice the time. After watching the movie I just can't explain the feeling that I had. I find this day a wonderful day. The movie helps me to be more positive and look forward for a brighter future. If there is a word that I can use to describe this film that would be excellent. In a modern-day nursing home, an elderly man named Noah begins to read a love story to his elderly woman companion from a book he carries. In 1940, at a carnival in Seabrook Island, South Carolina, local country boy Noah Calhoun sees 17-year-old heiress Allie Hamilton for the first time and is immediately smitten. She continuously refuses his persistent advances until their well-meaning friends lure them together. Noah and Allie spend an idyllic summer together, though her wealthy parents are less than enthusiastic about their summer romance. Allie is forbidden by her parents from seeing Noah again. 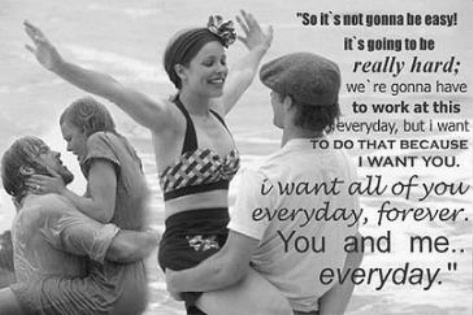 Noah tells Allie, he believes her parents are right. He is not good enough for her. Allie then becomes distraught and shouts at Noah; resulting in a break up between the two. She immediately regrets the decision but Noah drives away. Noah, devastated by their separation, writes her one letter every day for a year, with no replies. On the 365th day, he writes her a goodbye letter and decides to let her go. Noah and Allie move on with their lives; Allie attends Sarah Lawrence College, while Noah enlists to fight in World War II. While in college, Allie volunteers as a nurse's aide for wounded soldiers and meets the injured Lon Hammond, Jr., a wealthy and well-connected young lawyer who is handsome, sophisticated, charming, and comes from an old Southern family. The two eventually become engaged, to the joy of Allie's parents, although Allie wonders why she is reminded of Noah's face when Lon asks her to marry him. Noah returns home. While visiting Charleston to file some paperwork, Noah witnesses Allie and Lon kissing at a restaurant. Devastated, Noah is consumed with restoring an old plantation from their summer together, wanting to believe that if he keeps his promise to her and fixes it up, Allie will come back to him. Finished, Noah tries to sell the plantation, but finds he cannot part with it. While trying on her wedding dress, Allie spots an article about Noah's renovation on the Windsor Plantation in a newspaper. She decides to visit Noah in Seabrook and he invites her to dinner, during which Allie tells Noah about her engagement. Later in the evening, Noah asks Allie to come back the next day so he can show her something. In the present, it is made evident that the elderly woman is suffering from dementia, which has stolen her memories - and that Noah is her husband. She does not recognize their children and grandchildren, who beg Noah to come home with them. Noah insists on staying with his wife, refusing to abandon her. Back in 1947, Noah takes Allie out on a small row boat and shows her a flock of swans sitting on the water. It starts to rain and they have to go back. While he is tying up the boat, Allie demands to know why Noah never wrote to her. Noah tells her he wrote to her every day for one year. They begin kissing, then they make love to each other. Two days later, Allie's mother appears on Noah's doorstep while Noah is out, telling Allie that Lon has followed her to Seabrook after Allie's father told him about Noah. Allie's mother takes Allie for a drive and explains how she too once had a summer romance, and that she still drives by to watch him sometimes. They drive back to Noah's house and he is sitting on the porch. She hands her daughter the bundle of 365 letters that Noah had written to her, saying that she hopes Allie makes the right choice. She drives away and Allie goes to sit on the porch with Noah. She explains how Lon is in town and how the past few days had been wonderful, but very irresponsible. Noah is furious, accusing her of only loving Lon for his money, and says that if she leaves, he will hate her forever. She storms toward her car, and Noah yells after her that she's bored with her life, and if she wasn't she wouldn't have come. He begs her to stay with him, saying that he knows they fight and is willing to work it out every day if that's what it takes. He tells her that if she really wants to be with Lon, then she should go, because he lost her once and he could do it again. Confused, Allie tells Noah that she has to go and drives off. Distraught, she stops her car on the side of the road and reads Noah's letters, though she continues on to find Lon. Lon says that he has three choices: Kill Noah, beat Noah, or leave Allie. But he says that none of them make him end up with Allie, and that he loves her. She says she loves him too, but that she feels like two different people when she's with Lon and when she's with Noah. She says she knows she should be with Lon, but realizing that she can not live without Noah...At which Duke says "And they lived happily ever after." Making Allie ask "Who did?, Oh Yes! Of course." In the next scene, Allie appears at Noah's doorstep. They embrace in reunion. Present day, Noah's elderly companion suddenly realizes that she is Allie. She remembers her past, and that Noah is Noah. After finding out about her impending illness, she had herself written their story in the notebook years before with instructions for Noah inside: "The story of our lives, by Allie Calhoun. Read this to me, and I'll come back to you." But soon Allie relapses, and she finds herself in, to her, a stranger's arms. She yells for help, and nurses come to calm her down. The next morning, Noah is found unconscious in bed and he is rushed to the hospital; he later returns to the nursing home's intensive care ward. He goes to Allie's room later that night, and Allie remembers their love again. She asks him if he thinks their love can make miracles, and he says that miracles are what brought her back to him every time. She then asks him if he thinks their love can take them away together, and he replies, "I think our love can do anything we want it to." Noah's last words before falling asleep are "I'll be seeing you." The next morning, a nurse finds them in bed together, holding each other and discovers they died in the night. The credits roll with a shot of the swans flying away.